This is a guest post by Monica of Rose of Sharon Acres, who makes amazing soaps including the tooth 'chips' that I love and gentle goat milk soap from her own goats. She describes how she prepares Sabbath challah for her family, and how the Sabbath meal is enjoyed at her home. Our family feels drawn to learn more about the Biblical celebrations and incorporate them into our home, but I don't feel qualified enough to talk about them yet so I love it that Monica shared! When the yeast water has risen, add it to the flour side and knead for 7 minutes...sprinkle more spelt on the mixture to make sure it isn't gummy. During this kneading of the dough, I pray for the family (that we would be pliable in His hands) and for health - since Jesus is the bread of Life. After 7 minutes, let the dough 'rest' till it doubles in size. (set in a warm place covered with a towel). After doubling, I punch the dough and knead some then cut it in half. I cut the halves in thirds (which gives me 6 pieces of dough). I then roll each peace into strips and braid the bread - 3 pieces in each loaf. Let the bread rise again - keep covered so that the outside doesn't get hard. When it's doubled again, I take the yolk I saved earlier and add some water. Brush the bread gently (or it will collapse) with the egg mixture. This gives it a beautiful sheen. Bake at 350 for 20 minutes or so until it's a nice brown. Take a long knife and remove bread from cooking sheet (I use a clay sheet from Pampered Chef) and set it on a cooling rack. At Feast of trumpets I add raisins into it for fruit - you can also add flax but keep it to a minimum as it gets hard for some reason. Shabbat has been our family's glue; when Dad comes home on Friday the table is set, candles are lit and a special dinner is prepared. The kids always cleaned on Friday and I cooked...it's one of those ''God'" traditions that really kept our family strong. When Dad came home late- like at 10 pm the other night - we waited Shabbat for him. He smiled from ear to ear. Blessings for the father after a long week traveling. One thing that's nice is that the father of the house prays over each child a blessing. Then he prays over his wife a blessing and I in turn pray blessings over Dad. It's amazing what happens when we do that which our families. Dennis always prayed Proverb's 31 over me...part of that is 'she spys a field and buys it. The Lord allowed me to find this beautiful place with 21 acres. Me again: Isn't that beautiful? I skipped to the Sabbath chapter first in the Biblical Holidays book, this is where we started :) Also, I'm curious to see if I can make a soaked version of this bread using only whole grains- I'll let you know what I come up with if it turns out. 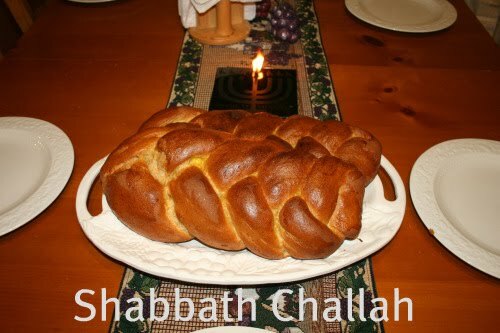 0 Response to "Challah and Sabbath Traditions- Guest Post"